See scan - very good condition with clasp missing. THIS IS AN EXTREMELY RARE AND SCARCE PIECE - awarded to no more than 10 or 20 people for risking their life and saving people from drowning - 2nd Class in silver. This is one of the rare Bulgarian Red Cross communist awards / decorations. Most likely from 1950s or 1960s. This lifesaving from drowning medal was awarded through the State Red Cross Organization Headquarters. Gold plated / heavy gilt. So far this is the first such silver class piece we've seen and had for sale. 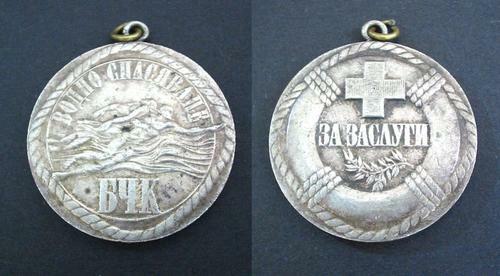 Scarce collector piece and one of the rare Bulgarian medals.